for easy turning and enhanced maneuverability. Wheel also locks in place for straight-line cutting. Feature 2 Hydrostatic drive for a smooth, consistent power flow. Fastest transport speed in the industry, up to 4.7mph and powered reverse. Feature 2 Advanced vibration dampening system for operator comfort. Feature 3 More versatile. Standard 18" wide blade can be replaced with 12", 16 , 20" or 24" optional blade assemblies in a matter of minutes. (24" blade available for 8 hp model only). Feature 4 Integrated throttle/clutch control on handle for simple operation; goes idle and stops machine movement when released. Feature 5 Blade placed at center of machine ensures a more consistent cutting depth. Adjusts to cut sod up to 2.5" deep. Feature 6 Cutting blade makes 20 cutting strokes per second / 1200 per minute. Yields cleaner, smoother results and increased sod cutting productivity. 1-3/8" cutting stroke is up to 50% longer than competitive models. Feature 7 Knobby tread drive wheels ensure better traction and eliminate dirt build up. 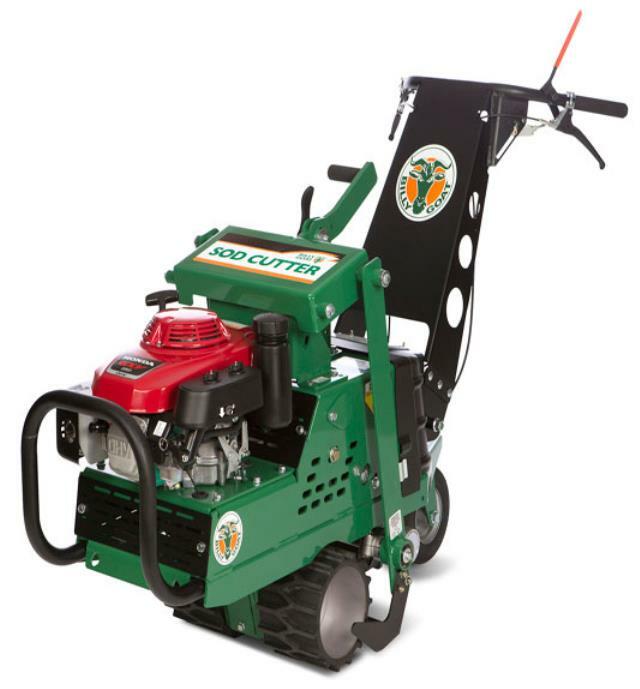 * Please call us with any questions about our cutter sod 18 inch pro hydro rentals in Lake Charles and Moss Bluff LA.